Bring the power of Google and the convenience of voice-interaction into the living room with the Google Home Mini hands-free smart speaker. Powered by Google Assistant, you can ask it questions, and tell it to do things. And with support for multiple users, it can distinguish your voice from others in your home so you get a more personalised experience**. It's your own Google, always ready to help. Just start by saying "Ok Google". Built-in far-field microphones ensure it will always hear and respond. Just by using your voice, get the latest weather, traffic, finance, news, sports and more. Ask for things like translations, calculations, nutrition information and unit conversions. Or find other information that you're curious about with the power of Google Search, Maps, and more, built right in. • "Hey Google, will I need an umbrella today?" • "No, rain is not expected today." Get personalised help managing your schedule, commute and more whenever Google Home Mini recognises your voice** (with your permission, of course). Plus, use it to set alarms, timers and reminders and listen to news and radio stations. • "Hey Google, wake me up at 6AM tomorrow." • "Got it, your alarm's set for 6AM." • "Hey Google, play The Crown from Netflix." Use your voice to control compatible smart lights, thermostats, switches and more from your favourite home automation systems like Philips Hue, Nest and Samsung SmartThings. • "Hey Google, dim the lights in the kitchen." • "You got it, turning off kitchen lights." Download the free Google Home App (available on iOS and Android) onto your smart device for easy set-up and control. Please note this app is required to operate Google Home Mini. *Controlling your thermostat requires a compatible smart thermostat and controlling your lights requires compatible smart lights. 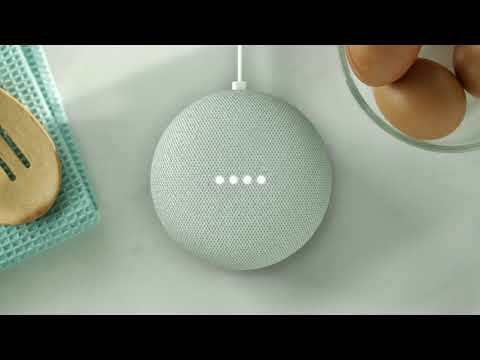 **Even if you're using Multi-user and Google Home Mini is meant to recognise your voice, keep in mind that a voice similar to yours, or a recording of your voice, could result in Google incorrectly recognising someone else as you. 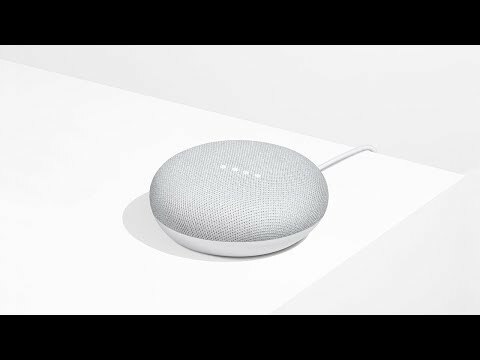 ***Google Home Mini is optimised for selected music and audio services only. Subscriptions/payments may be required. Controlling your TV requires a Chromecast or a TV with Chromecast built-in. Features • Keeps You Informed and Up to Date: Instant news, weather and commute updates without lifting a finger. • Master the Kitchen: Helps you with timers, step-by-step recipes, and conversions and substitutes. • Start Your Smart Home: Always improving with seamless connections to the latest compatible smart lights and thermostats. • Construction: Durable fabric top, Plastic housings created using recycled material, Non-skid silicone base. • Supported Audio Formats: HE-AAC, LC-AAC+, MP3, Vorbis, WAV (LPCM), FLAC. • Wireless: 802.11b/g/n/ac (2.4GHz/5Ghz) Wi-Fi, Bluetooth® 4.1 input support, Chromecast and Chromecast Audio built-in. • Speaker: 360 sound with 40mm driver. • Mics: Far-field voice recognition supports hands-free use. • Ports & Connectors: Micro USB port. • Supported Operating Systems: Android 4.4 or later, iOS 9.1 or later. • Dimensions: 98 x 42 x 98 mm (WxHxD). • Weight: 173g (Device), 75g (Power Adapter +Cable). • Power adapter and 1.5m cable. • Wi-Fi use requires 802.11 a/b/g/n/ac access point (router). • Google Home app running on a compatible mobile device. • Syncing services (such as backup) require a Google Account.